Blink has the ability to teleport herself and others at will. 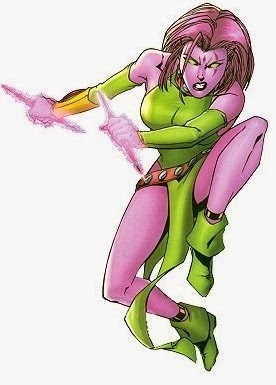 While the regular Marvel Universe version of Blink had little control over her abilities, the Age of Apocalypse/Exiles Blink had mastered several methods of utilizing her powers. Blink can teleport large masses, including sizable groups of people. She can also teleport only parts of objects. She can open portals that displace projectiles and even enemies that threaten her. She can focus her ability into short, transparent, crystal-like javelins, which teleport whatever people or objects they touch. She usually keeps a supply of these in a quiver around her back. Her teleportations are always accompanied by a "blink!" sound, from which she takes her codename. Offensive use of these powers include throwing her javelins charged with teleportation power. When they hit a person they can either teleport them away, or stun them unconscious by putting them "out of phase". She can also charge her javelins so they can cut through objects by teleporting the matter elsewhere as it touches an object. She has proven many times to be a skilled hand-to-hand fighter, and it is unknown whether her enhanced agility is the result of simple training or a consequence of her mutation. Blink also has a somewhat unusual appearance with lilac skin, dark pink hair, and pupil-less green eyes (this was a change in Exiles: both MU and AoA Blink had white eyes with a blue sheen). She also has pink marks across her face: these were present at birth, and are not scars, tattoos, etc.